Silas Deane was an American patriot and prominent member of the Continental Congress at the dawn of the American Revolution. On a diplomatic mission to France, Deane played a key role in obtaining the military supplies that made possible the victory at Saratoga in October 1777, leading to an alliance with the French the following year. His early achievements lost their luster, however, after Deane was recalled to face a protracted, rancorous battle with Congress over his financial dealings. He returned to Europe bitter and disillusioned, publicly questioning the wisdom of colonial independence and the break with Great Britain. Deserted by his former friends, broke and in failing health, Deane died just hours after boarding a ship that would have brought him back to end in his days in Connecticut. A native of Groton and the son of a blacksmith, Deane was one of seven children. He graduated from Yale in 1758 and for the next few years taught school while studying law. One of Deane’s students at the time, Edward Bancroft, would later become a close friend and confidant in Europe. Apparently neither Deane, nor his diplomatic colleague Benjamin Franklin, was aware that Bancroft, as historians would later discover, was a British double-agent. Admitted to the bar in 1761, Deane moved to Wethersfield where he began his law practice. His marriage in October 1763 to Mehitabel Webb, the widow of prosperous merchant Joseph Webb, gained Deane five step-children and entrée into the thriving West Indian trade. Deane and his wife had one son, Jesse, and in 1764 began building their home. 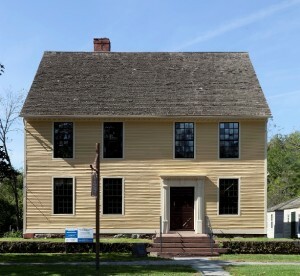 Their house, on Main Street in Wethersfield, stands next door to Mehitabel’s former residence, the Webb House, where George Washington, the Comte de Rochambeau, and their staffs met in May 1781 and planned the victorious Yorktown campaign. The Silas Deane House was declared a National Historic Landmark in 1964. Mehitabel Deane died in 1767. Two years later, Deane married Elizabeth Saltonstall Evards, another wealthy widow whose grandfather had been a colonial governor. The Saltonstall connection enabled Deane to expand his commercial and political network, gaining him election in 1768 to the Colonial Assembly of Connecticut. His star continued to rise and in 1774, Deane was chosen as one of the three delegates to represent Connecticut at the First Continental Congress in Philadelphia. Deane’s successful machinations in Congress were not seen in the same light back in Connecticut, where his opponents in the Assembly declined to appoint him to a third term. It was while serving out the balance of the lame-duck term that Deane was approached by members of Congress to go to France to work on securing military and naval supplies for the colonial forces and to sound out the French about the possibility of an alliance should the colonies declare their independence. He accepted the assignment in January 1776. Deane arrived in France in the guise of a commercial agent. The official cover provided by Congress was that he had come to buy goods on behalf of the colonies to trade with the North American Indians and was to be paid a commission of 5%. Through the ensuing months, Deane made a succession of official and unofficial contacts, ranging from the French Foreign Minister Charles Gravier, Comte de Vergennes, to unsavory privateers who preyed on British shipping. His most significant contact proved to be French businessman Pierre-Augustin Caron de Beaumarchais, an enthusiastic supporter of the American cause who became Deane’s confederate in obtaining French armaments—which the Crown was only too happy to deliver secretly—and shipping them to American ports. Deane also issued numerous military commissions to foreigners determined to enter into American service. Some of those commissioned, such as the Marquis de Lafayette, the Baron de Kalb, and Baron von Steuben, became prominent heroes of the American Revolution. Others, notably General Thomas Conway and French artillery officer Philippe du Coudray, caused problems for Washington and eroded Deane’s support in Congress. In December 1776, Deane’s status changed with the appointment by Congress of a three-member commission charged with opening formal negotiations with France. Joining Deane were the internationally renowned Franklin, who was named to head the mission, and Arthur Lee, a member of a powerful, politically connected Virginia family who soon became Deane’s arch-enemy. Arthur Lee’s carping to his brothers (two of whom served in Congress), embarrassments associated with the military commissions, and interminable delays and break-downs in written communications were among factors that led Congressional leaders to recall Deane in the fall of 1777. 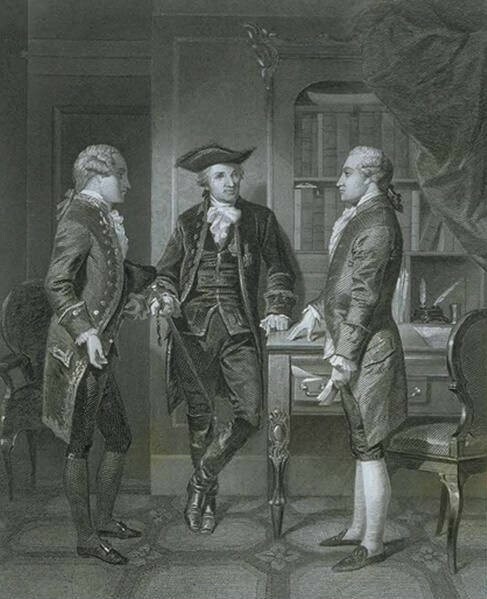 He remained in Paris long enough to bask in his greatest triumph: in March 1778, he, Franklin, and Lee were formally presented to King Louis XVI as their nation’s representatives in a ceremony that marked the successful negotiation of the Franco-American treaties of friendship and alliance. Deane returned to the United States aboard a French warship in July 1778 and learned that he was to report directly to Congress about his actions in France. Beginning on August 14, 1778, the date of his first appearance before Congress, Deane found himself on the defensive. He had left France without reconciling his financial accounts, leaving him vulnerable to charges of profiteering lodged against him by Lee’s allies. 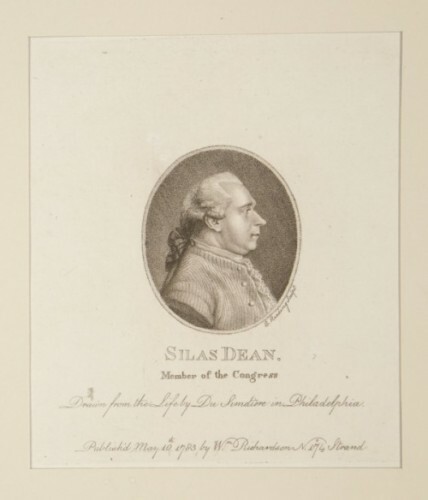 At one point, frustrated by Congressional inaction, Deane penned his own defense, “Address of Silas Deane to the Free and Virtuous Citizens of America,” published in the Pennsylvania Packet, which ignited a verbal campaign between Deane supporters and his opponents, led by Thomas Paine. Finally, in August 1779, Congress simply discharged Deane from further appearances, allowing him to return to France to settle his accounts in advance of an auditor appointed by Congress, who would determine what expenses and charges Deane would be reimbursed. Deane moved to London in March 1783. Among his first visitors was his former Connecticut friend, now a disgraced traitor, Benedict Arnold. Reports of their meeting caused Deane’s remaining political friends in America to renounce any connection to him. Deane’s health continued to decline; his remaining hope of recouping any money from Congress and regaining his financial footing all but evaporated. In 1789, at the urging of his brother Barnabas, he decided to return to Connecticut. He embarked for America on September 23, 1789, but died just four hours out to sea. The vessel returned to port and Deane was buried in England. In 1841, Congress awarded Deane’s heirs $37,000 in compensation for the failure to complete the audit of his accounts while he was alive.